To halt my slide into a deep pit of despair Because yesterday quickly turned into a Very Crappy Day, I opened a CDPackage from a Lovely, Lovely Person* that I had been saving for a Major Crappy Day. 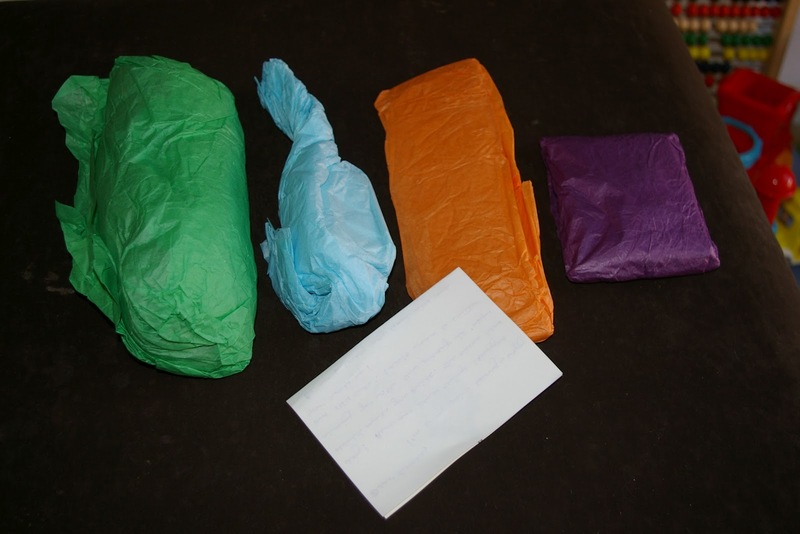 That package was JUST what I needed! 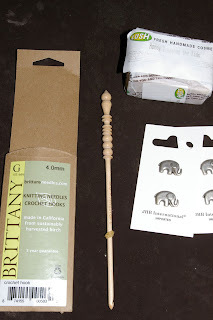 Adorable elephant buttons and a cute, little notebook! 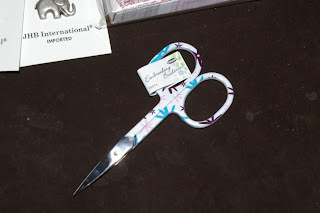 Pretty, sturdy scissors, the PERFECT size to keep in a bag with a project-in-progress! ...but it seemed too extravagant to buy any since I have an obscene adequate number of the standard, reliable metal hooks. So, every time that Crappy Day tried to rally its forces and drag me down again, I just smiled and thought, "A Lovely, Lovely person gave *me* a Brittany crochet hook! ", and the crappiness just disappeared. Thank you, Lovely Person! I was afraid there was no hope for yesterday, but YOU saved the day =)! I love the idea of using different bright tissue papers for wrapping! What an awesome present! AND. You definitely NEED those Brittany hooks because they are wooden which are very, very different from metal to use. Easier on the hands. Don't you agree? josephina--I don't know! 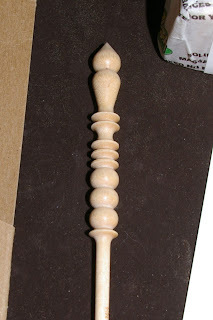 I've never used a wooden hook before =). I am excited to find out; if you are right, I might need to expand my wooden hook collection FOR THE SAKE OF MY HEALTH ;-). So much fun. Beautiful yarn. I could have used a CDP today - my day involved raw sewage and what promises to be a four-figure plumbing bill - I don't know what the final tally is yet as the plumber is coming back tomorrow. A crappy day - quite literally. Gina--I'm so sorry! That really would have been the perfect day for a CDP! Those elephant buttons are just too cute! There is NO such thing as too MUCH yarn. 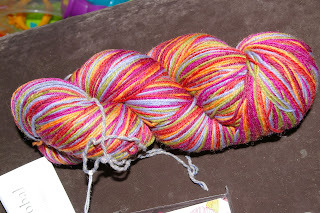 Unless your taking about the new yarn you need to ADD to your stash, because there is too much yarn that is not yours. T-Have I mentioned lately how much I like you? Because you are OBVIOUSLY a VERY wise woman ;-)!